EX CM Balochistan Nawab Aslam Raisani Heads Back To University After 30 Years And LOL, Pakistanis Ko Kuch Yaad Agaya! It is rightly said that learning has no age limit and Nawab Aslam Raisani is the recent example of it. 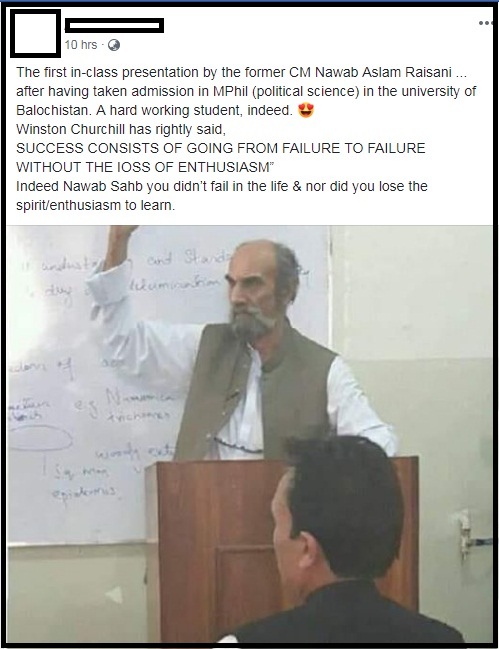 Yes, we are talking about Nawab Aslam Raisani who has enrolled himself in Baluchistan University for M.Phil degree programme. 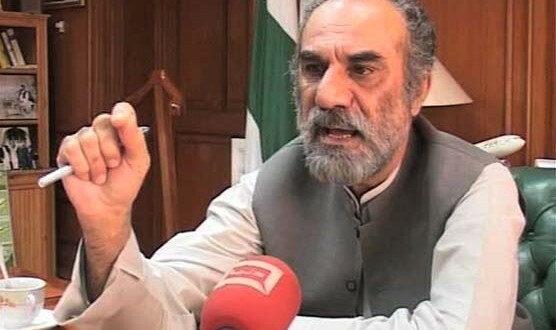 According to the details, the 64-year-old politician and former Chief Minister of Balochistan, Aslam Raisani has enrolled himself in M.Phil programme of Balochistan University where he will study political science. Nawab Aslam Raisani has completed his Master’s degree from the same university 30 years ago! Talking to a Saudi News Agency, Aslam Raisani said that his request for admission has been approved. Nawab Aslam Raisani also said that he has enrolled in the programme because he wants to learn. He clarified that he isn’t resuming his studies to get a better post. After getting his MPhil degree, Raisani has planned to get a Ph.d. degree as well. “A person can continue to learn until his last breath,” said Raisani. Nawab Aslam said that he had earned a Master’s degree in Political Science from the University of Balochistan back in 1989 and although he could carry out his intended research independently, he had obtained admission at the University of Balochistan after 30 years. ‘Because that would provide me a purely educational environment in which I could also consult my fellow students and thus enhance the research,’ added Aslam Raisani. In 2010, on a question about the verification of the degrees of members of Balochistan Assembly, Nawab Aslam Raisani stunned the nation by saying that ‘Degree To Degree Hoti Hai Asli Ho Ya Naqli’. His ‘remarkable’ statement is still remembered by people and that’s why on the news of his admission in Balochistan University for M.Phil programme, social media users are reminding him of that day! His Classfellows Would Enjoy His Company! He Is A Hard Worker, Indeed! Nawab Sahab, People Can’t Forget This! After scrutinizing Nawab Aslam’s educational documents, the University of Balochistan has approved his admission application. However, the University of Balochistan has made clear that it has a policy of canceling students’ admissions for missing classes as it is compulsory for an M.Phil student to attend 4 classes a week. The university has mentioned that the policy would apply to the former Balochistan chief minister as well. However, it is definitely appreciable that our political leaders also think that way. Nawab Aslam said that the motivating force behind resuming his studies was ‘passion for learning’ and he urged the parents to let their children free for learning. ‘”Educate your children for the purpose of learning, not for the sake of good jobs only”, said Raisani. Nawab Aslam Raisani is the Member of Provincial Assembly to represent his native district Mastung there. During the Pakistan People Party tenure, Nawab Aslam has served as the Chief Miniter of the Balochistan. The chief of Sarwan tribe is considered as an important political personality of Balochistan.